Poedjiati Tan, Women Representative, moving forward. My beloved friends, today, standing here and welcoming you to the 5th ILGA ASIA conference is the moment of true, for every one. Your participation … surely contribute great energy for the phoenix to flying high. Most you must remember our 2010 unfolded conference theme, … “moving frward”! Being here, is an evidence that, we are unstopable from moving forward. We have been moving forward since then, in spike of many obstacles. In spike of the people of Surabaya have tried to stop us. And some other people around the region keep trying to stop us. But, we never give up, because we never give up, we can not be stopped, so now we can claim this phoenix spirit! Thank you to everyone that, have helped make this conference running. Whatever you do, whatever your parts, all are important. Thank you, thank you all. Your present here, shown how important is to be unitied, the togetherness to keep faith that we all, the mankind have the equality, to live and, to love, just the way who we are. And I’m very proud of you. And I’m very grateful to the supports, from Anjaree and Sky Rainbow. I’m very grateful to the kindness of Thai’s people. That their kindness, understanding and appreciation of the equality of human rights, has provide such a support, directly or indirectly. We hope, from here, a firm platform for the phoenix to take off to the sky. Although, more and more people become aware of diversity in sexualities, doesn’t authomatically lift up our burdens, and granted us our place in the society in many countries. Our movements, our struggles,… must go on! Our links must be tighthen! What happening in the super power USA today, is the dawn of hope for us. We hope, we can take the momentum for our movements. But yet, for most of us, the rights, for equality… will not landed, on our lap easily. We must hand in hand together. Supporting each other and growth stronger. We must build and maintain a solid platform for our phoenix rising spirit. And guide by the same spririt, like a phoenix, we will be able to rise, we will be able to regaining our power whenever it’s smacked down. 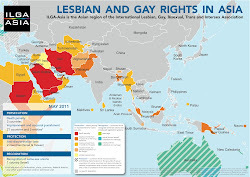 The 5th ILGA ASIA conference might not the perfect conference. I personally have prepared mentally and physically, to work hard, but also allowed myself for imperfection. However, as one, every one can contribute to the success of this conference. And I believe in each of you, for your great supports. And when we succeed, that will be ours success. So, let together to strart our journey from our present state to the desired state.